The Boone and Crockett Club today released a comprehensive essay on conservation and preservation, which was approved by its board of directors during the Club's 130th annual meeting at Savannah, Georgia. 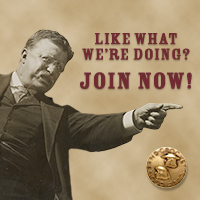 Club members gather the first Saturday each December to commemorate the founding of the organization by Theodore Roosevelt in 1887. "Even during Roosevelt's time, there was a debate about the roles conservation and preservation should play in the use of natural resources and the recovery of decimated wildlife populations," said Boone and Crockett Club President Ben Hollingsworth Jr. "Today, more people are engaging in and having a greater influence on natural resource issues than ever before. Unfortunately, it appears far too many people are confusing the terms or not understanding what they mean. Most want to do what's best, but many mistakenly believe they are supporting conservation when in fact they are supporting actions that stop conservation from happening. Having over a century's worth of experience applying both conservation and preservation, the Club thought it was time to share what it has learned." The new essay explores the results preservation and conservation can produce and their relative effectiveness against inescapable forces such as climate change, invasive species, human population growth, and use of natural resource. It explains the important role of science and why the notion of "letting nature takes its course," which is a phrase associated with preservation, will never result in the outcomes people really want in the vast majority of our landscapes, ecosystems, and economies. Conservation and preservation are both concerned with protection of the environment, but they are based on different philosophies and management strategies that produce different results. Conservation is based on wise use and active management, and recognizes that people are part of nature and depend on natural resources; preservation views people as a negative influence on nature and seeks to eliminate their influence. Despite their dissimilarities, however, the Club has never viewed conservation and preservation as opposing schools of thought. Conservation is the overarching concept with preservation being one of many management options within a broad conservation approach. Hollingsworth Jr. noted, "The Club has always believed preservation has value in the right place at the right time but not as a substitute for conservation in all instances. History proves this has been the correct approach." "If you read this essay, not only will you acquire a working knowledge of conservation and preservation, it will bring to light the widespread misuse of the terms conservation and conservationist by the media and some organizations," Hollingsworth Jr. continued. "The challenges facing our wild places and wild things today are serious and complex. Whether it be intentional or out of ignorance, leading people to believe that locking up our natural resources is the only way to protect those resources and then calling it conservation is a major problem these resources cannot afford. The Club is encouraging everyone, from journalists to educators to concerned citizens, to read this essay in order to develop a common understanding of conservation and preservation and what each can achieve. "What we need to be doing is advancing natural resource polices to achieve socially acceptable and ecologically beneficial results," Hollingsworth Jr. concluded. "This has been made more difficult by the confusion and misinformation circulating today about historically proven best practices. We hope this essay will help clear up a few things so conservation can continue to thrive."